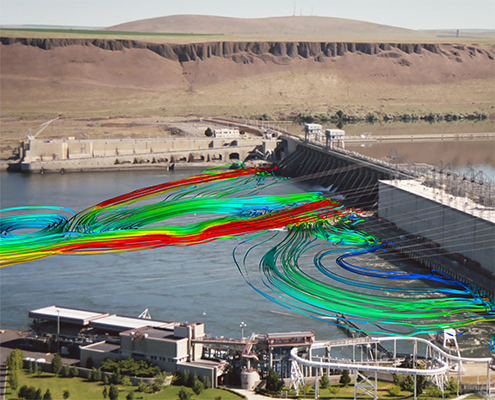 IIHR worked with the U.S. Army Corps of Engineers (Walla Walla District) to provide numerical modeling and analysis to support fish passage and improve salmon survival rates at the McNary Dam on the Columbia River. IIHR’s fully 3D multiphase numerical model, developed in-house, can simultaneously predict the hydrodynamics of the tailrace and total dissolved gas (TDG)—the only such model of its kind of existence. Elevated TDG supersaturation can cause gas bubble disease in fish — similar to the bends in humans. In addition, stunned fish fall easy prey to predators below the dam. IIHR’s simulations modeled the very complex flow patterns in the tailrace, as well as fish movement and fish exposure to predators and TDG. The model was validated with data collected by USACE on TDG and velocity. IIHR’s model is the only one in existence that couples hydrodynamics and total dissolved gas. This validated model has also been used at several other hydroelectric dam projects. IIHR has decades of experience collaborating with major hydroelectric utilities in the Pacific Northwest to increase the survival of fish passing hydropower dams.